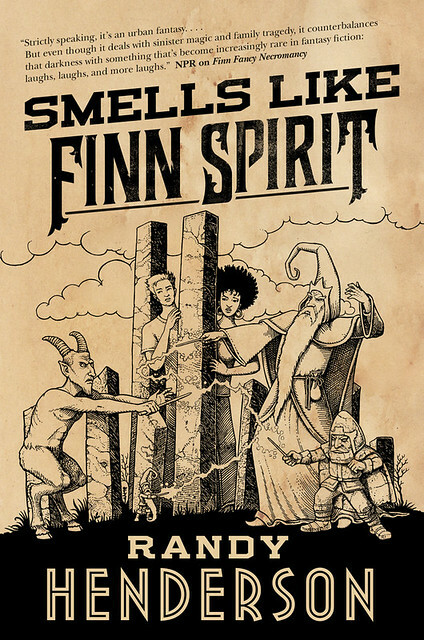 In today’s Big Idea, author Randy Henderson and his protagonist have a chatty conversation about Henderson’s new novel, Smells Like Finn Spirit. Let’s see what they have to say to each other this time, shall we? Well, Finn, this is it. A trilogy! As its main character, how do you feel? Yup. So then, what do you think is the big idea behind Smells Like Finn Spirit? I guess for me the big idea is how the series and I have evolved over these three books together. It has been as much a journey for me as for you. — but the sequels needed to offer something a little deeper in the worldbuilding and the characters so that they weren’t just repetitious repeats, and supported a trilogy arc. And as I look back at them, it is interesting to see how the events in this world, and my life, seeped into that world. For the hundredth time, Finn, there’s nothing wrong with Milli Vanilli’s music! Well, I can look back now, and see how I was channeling some the darkness of the real world into the growing darkness in the books. No. Book 3 only goes up to 1992 culturally, you know that. In 1992 we were riding high on Grunge, there was no way we could have foreseen a future that terrible. No! What I meant was, Book 2, Bigfootloose and Finn Fancy Free has elements of racial tension and a group of feyblood rights activists pushing back against the abuse of power. Bigfootloose was begun at the end of 2013 after the Trayvon Martin decision and a number of other difficult events in our nation, and written over the course of 2014, a year that saw great upheaval in my personal life. Looking back, it all seems pretty obvious to me how that seeped into my work. Well, no. I wasn’t writing a political piece, I was trying to give readers a fast-paced and funny fantasy adventure. But in a series that’s been labeled “dark and quirky,” book two tipped a little more onto the darker side and book one on the quirky side, I’d say. No, at least not the plot. I actually conceived book 3 in late 2014 well before the Orange One dominated the election season. Oddly enough, yes. There are some strange parallels in retrospect, so maybe I was just tuned on some subconscious level to what was coming. Like the Oracle from the Matrix! “More like Season One Deanna Troi. And you know I love politics even less than I like lentils, and that’s saying something. So how about you get to the point? Fine. Having (I feel) grown as a writer during this journey, and gotten the hang of writing to deadline, I feel that in Smells Like Finn Spirit I successfully blended the humor and pacing of book one, plus the best aspects of world-building and character development from book two, all with half the calories. – I’m pretty dang proud of how this “dark and quirky” urban fantasy trilogy turned out, and our growth together. And, well, I’m proud of you, Finn. Maaaybe. But come on, Finn, would you really be happier in some other author’s head? What if they renamed you, like, Blaine, and put you in a 1600’s love triangle with a vampire and a pirate or something? I mean, you wouldn’t even have decent plumbing, let alone access to a Commodore 64. That’s right, I did! And introduced you to Nirvana, Boys II Men, Blur – come on. Would you really take Dawn away from her music? Oh, look, the links! That means it’s time to go. Specifically Miami University, down the road in Oxford, OH (to head off any comments on this score, the Miami in Florida is named after the Miami Valley of Ohio, which is where we live, and Miami University was actually founded before Florida became a state). 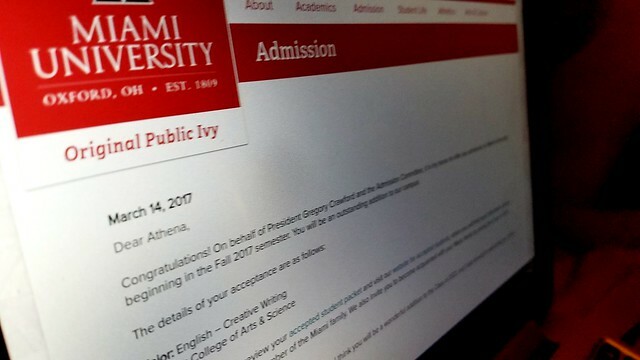 We’re super-thrilled about this; Miami was one of Athena’s two top choices for college and it has an excellent reputation for undergraduate education — among national universities, in fact, it ranks #2 in the nation for undergraduate teaching (#1: Princeton; #3: Yale; my own University of Chicago isn’t even in top 20, alas). And it’s one of the “public ivies.” So I feel pretty sure she’ll get, you know, a decent education. Krissy is happy it’s not too far away — it’s about an hour down the road — so we have a decent chance of seeing our kid on more than just the occasional holiday. And Athena is happy, because now she knows she’s going to college. In all, a happy day. One thing different now than in the past: Athena found out her status by checking in online (they posted acceptances at midnight), so she didn’t have to wait for either the happy big package or depressing thin slip in the mail, like I did 30 years ago. I figure this is actually a positive step forward. It seems slightly less stressful in any event. So: Yay! My kid’s going to college! If you would like to congratulate her in the comments, I would not look askance upon it.